For the corn relish: Grill or roast the corn to char. Remove the corn from the cob. Dice the tomato extremely small, almost to a pulp. Dice the onion, jalapeno, and garlic. Add tomato, onion, and garlic, and jalapeno to the corn. Microwave the vinegar until hot and steaming. Pour vinegar over corn and mix well. Allow to sit at room temperature until it's time to serve. For the chicken: Chop the chicken into 1 inch pieces. Dice the onion and mince the garlic. Sear the chicken in some oil just to brown and remove from pan. Cook the onion to lightly brown, about 15 minutes. Add the garlic and spices and cook 1 minute. Take the pan off the heat and add the bourbon to prevent a flame-up. Add the Worcestershire and brown sugar. Return the chicken to the pan and simmer about 20 minutes until the chicken is cooked through and the sauce has thickened. When I was first asked to create a recipe for Bourbon Chicken, I didn't even know it existed. Bourbon and chicken sounded like a great combo to me, so I signed up. A quick Google search informed me that Bourbon Chicken is a fast food dish that is usually fried, and—get this—contains no bourbon at all! 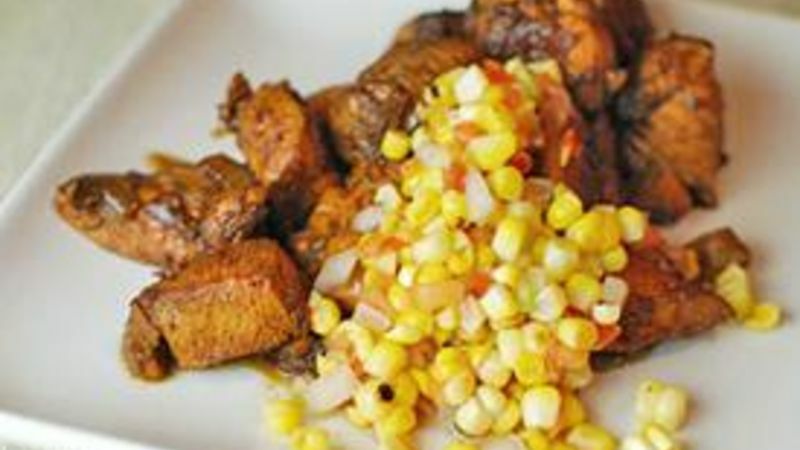 My version of Bourbon Chicken with Corn Relish aims to buck this trend of bourbon-less “bourbon” chicken. It’s sautéed, not fried, savory, sweet, and smoky, and actually tastes like bourbon! First, char up the corn nice before you make the relish. Mix this together, then just pour on some hot vinegar and you’re good to go! Sear up the chicken before adding the sauce ingredients. After simmering, the sauce will thicken slightly and coat the chicken pieces. Serve with some rice or like I did, with some flour tortillas. This bourbon chicken recipe is easy to make and really hits all the right flavors! Dan Whalen will take any excuse to buy a bottle of bourbon. He has been blogging for over 4 years at The Food In My Beard; check Dan's Tablespoon profile often to try his recipes with creative international spins!